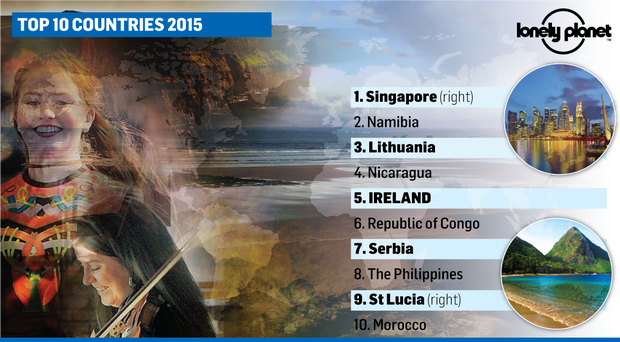 Lonely Planet’s influential travel guide has just ranked Ireland 5th on its list of Top 10 in the World to visit in 2015. This mention in Lonely Planet gives Ireland a much needed boost to an already recovering economy. According to Lonely Planet for people planning on taking a trip to Ireland, there is no better time than the present. The Lonely Planet Guide is found to be hugely influential for those planning a vacation in Ireland. According to the guide, hospitality is one of Ireland’s “true” qualities. The Lonely Planet’s love of Ireland extended specifically to the counties of Kerry and Dublin this Summer when it featured the Cromane Peninsula and Kavanagh’s Pub in Glasnevin in Europe’s Top 50 Secrets. Counties Cork and Derry received widespread media coverage when it ranked amongst the top 10 cities to visit in 2010 as well as 2013. The popularity of the guidebook can also be damaging however when in 2006 the guidebook listed Dundalk town as being “tough, dour and charmless”. Now positively we can advise that almost a decade later Ireland has received a glowing reference for people planning a trip to Ireland “With the Wild Atlantic Way now fully open and a new sense of optimism surging through the country, 2015 really is the time to go to Ireland,” a Lonely Planet spokesperson said. This entry was posted in Best Attractions in Ireland, Best Places to visit in Ireland, Flights to Ireland, Ireland, Ireland Travel, Ireland vacations and tagged Ireland, Lonely Planet Guide Book 2015, Travel to Ireland, Trip to Ireland. Bookmark the permalink.